Thank you for your interest in providing dinner to the families at Ronald McDonald House Charities of Northwest Ohio. We are located at 3883 Monroe St., just north of Toledo Hospital. 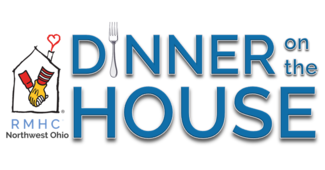 We provide dinner for our families 7 days a week. We ask that all food be prepared on-site. Due to our food service license we cannot accept pre-cooked food to be served at the House unless it has been prepared in a commercial kitchen. Volunteers should plan to arrive no later than 4:00 PM for meal preparation. All dinners are served at 6:00 PM. We have adopted a no waste program and all leftovers are packed in lunch size containers and stored in the community refrigerator available to the families. This makes lunch an easy grab and go for families whose sick children are in the hospital and gives them a healthy home cooked meal for lunch. If you would like to sign up to prepare a meal for our families, please accept our sincerest gratitude and use the electronic form below to identify the date you will be on-site to prepare a meal. Once you have signed up, someone from the House will contact you close to the date and provide you with the number of guests in the House so you can gauge the amount of food you will need. We can also provide guidance on favorite meals and dinners that have recently been prepared so we are not serving the same meals too close together. The number wanted is only a guide, dinner can be prepared by 1 to 10 people!